Brad Angers shares his wartime story with interviewer Debra Decker, an American Red Cross volunteer for the Veterans History Project, which becomes part of a collection of personal accounts of American war veterans through the Library of Congress. The American Red Cross, Tampa Bay chapter, has taken on this project, videotaping veterans in Florida from Tampa Bay to Port Charlotte. The last known American veteran of World War I was Frank Buckles, who died in February 2011 at 110 years old. Buckles was an Army soldier who enlisted in 1917 and served with a detachment from Fort Riley in Kansas. He was an ambulance driver near the front lines in Europe. During World War II, he was captured by the Japanese while he was a civilian working in the shipping business. Buckles spent three years as a civilian prisoner in the Philippines before his release. The Department of Veteran Affairs said in 2012 that there were 1,462,809 World War II veterans still living, with 670 veterans on average dying every day. In 2011, the median age of these World War II veterans was 92. The Library of Congress already holds 65,000 oral histories in the Veterans History Project of those serving in the U.S. Armed Forces from World War I to now. It is considered the largest oral history project in this country to date. Veterans’ service organizations, universities, schools and community groups have been used to record the oral histories of veterans across the country. Locally, the Tampa Bay chapter of the American Red Cross has taken on the task of recording these histories from the Tampa Bay area, including Pasco County and south to Port Charlotte. Rodriguez considers the oral history project a good choice considering the organization’s strong involvement with Armed Forces servicemen and servicewomen. The Red Cross has a service-person fill out a form when they join so family can be reached with messages, if needed, 365 days a year, Rodriguez said. Then the Red Cross educates the family so it knows what to do. They even get Rodriguez’s business card and are encouraged to call him if they have concerns. “For the commander to arrange the release of a service member, the Red Cross must arrange it,” Rodriguez said. So it is little wonder that the Red Cross locally is working with veterans to get as many wartime experiences recorded as possible. Rodriguez explains they are trying to get the older veterans first, before getting the more recent war stories from more recent veterans. World War II veterans are the most important to record because of their advancing ages. 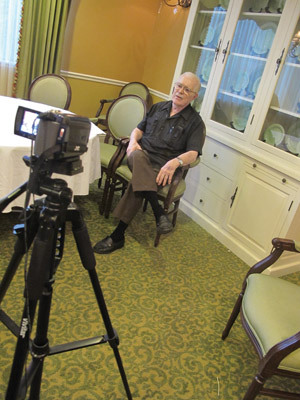 During the first day of videotaping these oral histories, there were seven local veterans who signed up to go to SunTowers retirement community and spend one hour recording their history. The day is long for volunteer Decker, who has back-to-back interviews with little time in between. She tries to guide the veterans telling their histories so that there is a personal accounting of their lives so long ago. These veterans of World War II must look back to their lives more than 70 years ago. Some of these men had enlisted as early as 16 years old, with their parent’s permission. One man shared an experience from the Pacific theater. He also talked about how the Japanese flew toward them with their backs to the sun, making it hard to see them. This veteran explained how the Japanese always had to drop the bombs because they were so heavy. If the bombs were not dropped, the aircraft could not climb again to a flying altitude. This veteran was describing the Battle for Henderson Field on Guadalcanal, which took place from Oct. 23 to Oct. 26, 1942, and was a land, sea and air battle of the Pacific campaign fought between the Japanese and the Allied Forces, mainly the U.S. Army and U.S. Marines. Major Gen. Alexander Vandegrift led the men against an attack by the Japanese 17th Army under the command of Lt. Gen. Harukicki Hyakutake. On Oct. 26, Hyakutake ordered his troops to retreat, leaving behind a string of bodies that stretched more than a half mile. The veteran said he was in 16 major battles and served on the destroyer USS Meredith. Another veteran talked about how the gun turrets were designed to work automatically from a remote station. He was a private working the midnight shift. His job was to get the film to the film lab. Another talked about serving in the Army Security Agency, which later became the National Security Agency. Brad Angers lives in Riverview and is 83 years old. When he was 15, Angers wanted to join the military. He approached his father and pleaded with him to allow him to join the Army when he was 16 years old. Angers was assigned to the Signal Corps as a teletype decoder and shipped out on the Collins, a troop ship that went to the Philippines with the 9th Detachment. The jungle climate gave him “jungle rot” on his hands and his feet, Angers said, so he was placed aboard the hospital ship Hope and taken back to the United States to get better. By then, the Korean War was ready to begin and Angers decided not to re-enlist. “If I stayed, it was possible it would have put me on the ground in combat,” Angers said. Angers only served for a year and a half, but credits the military for giving him the experience he needed to live his life. The third Friday of every month from 10 a.m. to 4 p.m., the Tampa Bay Chapter of the American Red Cross is scheduling videotaped interviews. The interviews are being conducted at the SunTowers retirement community in Sun City Center. The Veterans History Project collects and preserves the personal accounts of American war veterans so that future generations might know the realities of war through their stories. They will be preserved through personal narratives, correspondence and other visual materials like photographs or drawings. SunTowers is located at 101 Trinity Lakes Drive, Sun City Center.